May 29, 2014 - Lyme disease is a stealthy, often misdiagnosed disease that was only recognized about 40 years ago, but new discoveries of ticks fossilized in amber show that the bacteria which cause it may have been lurking around for 15 million years - long before any humans walked on Earth. The findings were made by researchers from Oregon State University, who studied 15-20 million-year-old amber from the Dominican Republic that offer the oldest fossil evidence ever found of Borrelia, a type of spirochete-like bacteria that to this day causes Lyme disease. They were published in the journal Historical Biology. In a related study, published in Cretaceous Research, OSU scientists announced the first fossil record ofRickettsial-like cells, a bacteria that can cause various types of spotted fever. Those fossils from Myanmar were found in ticks about 100 million years old. As summer arrives and millions of people head for the outdoors, it's worth considering that these tick-borne diseases may be far more common than has been historically appreciated, and they've been around for a long, long time. "Ticks and the bacteria they carry are very opportunistic," said George Poinar, Jr., a professor emeritus in the Department of Integrative Biology of the OSU College of Science, and one of the world's leading experts on plant and animal life forms found preserved in amber. "They are very efficient at maintaining populations of microbes in their tissues, and can infect mammals, birds, reptiles and other animals. "In the United States, Europe and Asia, ticks are a more important insect vector of disease than mosquitos," Poinar said. "They can carry bacteria that cause a wide range of diseases, affect many different animal species, and often are not even understood or recognized by doctors. "It's likely that many ailments in human history for which doctors had no explanation have been caused by tick-borne disease." Lyme disease is a perfect example. It can cause problems with joints, the heart and central nervous system, but researchers didn't even know it existed until 1975. If recognized early and treated with antibiotics, it can be cured. But it's often mistaken for other health conditions. And surging deer populations in many areas are causing a rapid increase in Lyme disease - the confirmed and probable cases of Lyme disease in Nova Scotia nearly tripled in 2013 over the previous year. A series of four ticks from Dominican amber were analyzed in this study, revealing a large population of spirochete-like cells that most closely resemble those of the present-day Borrelia species. In a separate report, Poinar found cells that resembleRickettsia bacteria, the cause of Rocky Mountain spotted fever and related illnesses. This is the oldest fossil evidence of ticks associated with such bacteria. "Before he was frozen in the glacier, the iceman was probably already in misery from Lyme disease," Poinar said. "He had a lot of health problems and was really a mess." Industries posing the greatest environmental threats to communities in NSW will face tough new measures. The measures provide the State’s environmental watchdog, Environment Protection Authority (EPA), with the toughest regulatory powers in Australia, and shift the balance of power back to the regulator instead of the polluter. Environment Minister Rob Stokes said that for too long the EPA had been operating under conditions that made it difficult to effectively regulate operators who continually did the wrong thing. Increasing fines for the 10 most serious environmental offences from $1500 to $15,000 for corporations and from $750 up to $7,500 for individuals. Introducing risk-based licencing from 1 July 2015. Giving the Land and Environment Court alternative approaches to sentences, including the ability to set restorative justice actions that benefit the environment and victims of environmental incidents. Closing liability loopholes for operators looking to avoid penalties. Proposing changes to NSW’s waste regulations to reduce licensing thresholds for waste recycling and storage activities (currently 2,500 tonnes at any one time proposed down to 1,000 tonnes) to stop stockpiling. Seasoned professionals and amateurs alike were eluded by their rare feathered friends in the Blue Mountains National Parks last week during the National Regent Honey Eater and Swift Parrot bird census, but their absence is good news for the coast. “We are seeing a strong flowering in coastal habitats this year, making excellent feeding grounds for the two species of quick and colourful birds,” Office of Environment and Heritage Senior Natural Heritage Officer Debbie Andrew said. “The annual census has been running for more than a decade and was undertaken by Birdlife Australia in partnership with the Office of Environment and Heritage. “The survey covered hundreds of kilometres of tracks and trails looking for the two endangered species, recording all wild life sightings and their GPS locations along the way. “Volunteers from the Office of Environment and Heritage and from non-government organisations, such as Birdlife Australia, drove, walked, and ‘binoculared’ their way across the Warragamba Special Area of the Nattai National Park and Yerranderie State Conservation Area in their search. “The annual migrations bring hundreds of birds into coastal national parks and reserves adding a wonderful sense of suspense and wonder for anyone looking and lucky enough to see them. 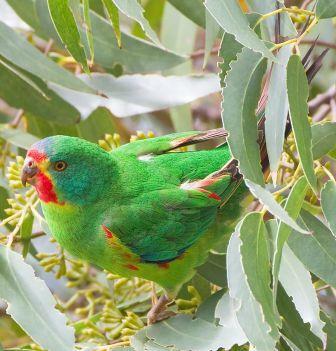 “The Blue Mountains World Heritage National Parks are often a seasonal favourite feeding ground of the migratory nectar feeding birds, however Swift Parrot sightings over the last few weeks have mainly been along the coastal regions of NSW,” Mrs Andrews said. “The coastal spread of sightings shows the importance of having a range of habitats protected across different regions in the state for these threatened species,” Mrs Andrew said. “The coastal banksia shrublands are producing a lot of nectar at the moment and in Royal National Park there are 13 different species of honeyeater, including the Swift Parrot,” Mrs Andrew said. “There are also a large number of different species of honeyeater in Kur-ring-gai Chase National Park and in areas of Western Sydney, such as the Mulgoa Nature Reserve in the Cumberland Plain Woodland, an endangered ecological community,” Mrs Andrew said. “There haven’t been any reports of Regent Honeyeater yet but they could also turn up on the coast this year, a year when the eucalypt woodlands of the western slopes are not flowering well. The Swift Parrot is listed as Endangered under both NSW and Federal threatened species Acts. The Government is undertaking a comprehensive review of Ozone Protection and Synthetic Greenhouse Gas legislation to ensure continued protection of the environment, while reducing the complexity for businesses and individuals who operate under the legislation. Protecting the ozone layer is one of the world’s great environmental success stories. The ozone layer is expected to recover by the middle of this century as a result of global action taken through the Montreal Protocol on Substances that Deplete the Ozone Layer. Alternatives gases such as hydrocarbons, carbon dioxide and ammonia when used safely play an important role in reducing the impact of refrigerants on ozone depletion and climate change. However, many alternatives are highly flammable and toxic. This review will examine how to address potential risks which are being increasingly reported due to the impact of Labor’s carbon tax on Australia’s refrigeration and air-conditioning industry from the sudden jump in costs for synthetic greenhouse gases. The Australian Institute of Refrigeration, Airconditioning and Heating has raised safety concerns that the carbon tax has led to the unsafe handling and use of alternate gases in systems that were not designed for their use. We all saw what happened with Labor’s pink batts fiasco. An ill-designed and poorly implemented scheme resulted in tragic consequences. As a consequence the Government has raised industry’s concerns with the Heads of Workplace Safety Authorities who represent all jurisdictions on these matters. The Department of the Environment will continue to work closely with industry and state and territory work health and safety regulators to improve awareness of the safety risks. Businesses and the community will be consulted throughout the Ozone review. 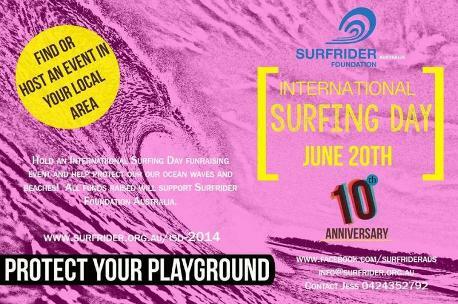 Submissions on the Terms of Reference are invited by 18 July 2014. An interim report is expected to be available for comment by the end of 2014. A final report will be delivered to the Government in mid-2015. May 28, 2014 – A new study has found that the Antarctic Ice Sheet began melting about 5,000 years earlier than previously thought coming out of the last ice age - and that shrinkage of the vast ice sheet accelerated during eight distinct episodes, causing rapid sea level rise. 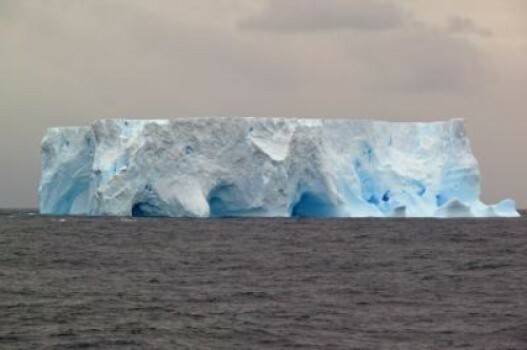 "The sediment record suggests a different pattern - one that is more episodic and suggests that parts of the ice sheet repeatedly became unstable during the last deglaciation," Weber added. "During that time, the sea level on a global basis rose about 50 feet in just 350 years - or about 20 times faster than sea level rise over the last century," noted Clark, a professor in Oregon State's College of Earth, Ocean, and Atmospheric Sciences. "We don't yet know what triggered these eight episodes or pulses, but it appears that once the melting of the ice sheet began it was amplified by physical processes." Today, the annual calving of icebergs from Antarctic represents more than half of the annual loss of mass of the Antarctic Ice Sheet - an estimated 1,300 to 2,000 gigatons (a gigaton is a billion tons). Some of these giant icebergs are longer than 18 kilometers. In support of the UN designation of 2014 as the International Year of Small Island Developing States (SIDS), WED this year will adopt SIDS in the broader context of climate change as its theme. Our objectives are to help build momentum towards the Third International Conference on SIDS in September and encourage a greater understanding of the importance of SIDS and of the urgency to help protect the islands in the face of growing risks and vulnerabilities, particularly as a result of climate change. We believe WED will be an excellent opportunity to raise a call for solidarity with the islands. May 27, 2014 - Researchers have today released ground-breaking findings that dismiss the 'Neutral Theory of Biodiversity'. The theory has dominated biodiversity research for the past decade, and been advocated as a tool for conservation and management efforts. Professor Sean Connolly from the ARC Centre of Excellence for Coral Reef Studies (Coral CoE) at James Cook University (JCU) is the lead author of the international study, which he says overturns the long-used theory by employing a novel mathematical method. 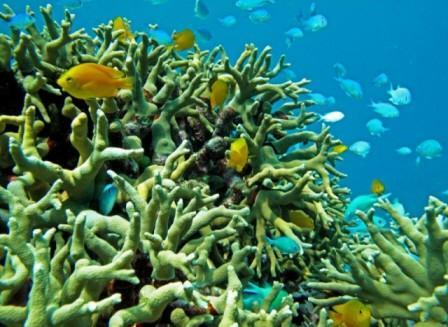 It is the largest study of its kind, covering a broad range of marine ecosystems on Earth. "The study has important implications for how marine conservation areas are managed," Professor Connolly says. "The aim of neutral theory is to explain diversity and the relative abundances of species within ecosystems. However, the theory has an important flaw: it fails to capture how important the highly abundant species that dominate marine communities are." Professor Connolly explains that it's often the really abundant species that deliver substantial ecosystem services like providing habitat for fishes, or keeping reefs clear of seaweeds. "These species have unique features that allow them to be so abundant, and to play those key roles," he says. But when neutral theory underpins marine conservation, species are treated as swappable. "So the theory implies that, if you lose a really abundant species, then another can simply increase in abundance to take its place." Using neutral theory, species become common or rare as a consequence of random processes: chance variation in who a predator happens to eat, or whose dispersing offspring happen to land on a vacant bit of real estate on the seafloor. This study shows that these random processes are not strong enough to explain the large differences between common and rare species. Professor Connolly points to Caribbean coral reefs as an example of why this problem with neutral theory can be important. "Until the 1970s, these reefs were dominated by two species that were close relatives of the branching corals that dominate the reefs of the Great Barrier Reef. When these species were nearly lost as a consequence of overfishing and other forms of reef degradation, no other coral species increased to fill the gap," he says. "Those species had particular traits that made them so abundant, and therefore critical to a functioning healthy reef system," continues Dr Julian Caley a co-author of the study from the Australian Institute of Marine Studies (AIMS). "Both biodiversity theory and conservation managers need to be alert to these characteristics, because it is often the common species, not the rare ones, that are most important to healthy ecosystems," Dr Caley explains. "The results of this study are also unprecedented in their remarkable consistency across a very large set of vastly different ecological systems throughout the world's oceans," he adds. The study looks at 14 different marine ecosystems sampled at 1185 locations across the globe. The datasets range from the polar to tropical regions, from deep-sea to shallow coral reef environments and intertidal zones. It includes vertebrates as well as invertebrates, from plankton, to clams, to coral reef fishes. To overturn neutral theory, the study used a novel mathematical method that identified common predictions of the different models that form the theory. These predictions were then tested against this wide array of marine ecosystems. The NSW Government recently undertook a comprehensive review of all the legislation that regulates Crown land. The Government plans to develop consolidated, streamlined legislation to underpin the management of Crown land in the future. The White Paper contains proposals to develop one new piece of legislation that will replace eight existing Acts, streamline existing provisions, simplify the management of Crown reserves and reduce red tape. The White Paper can be downloaded from the 'Consultation Website' link located at the bottom of this section. Email: Submit your feedback using the 'Crown Lands Information' link under 'More Information'. The Government invites written submissions on the White Paper until 20 June 2014. 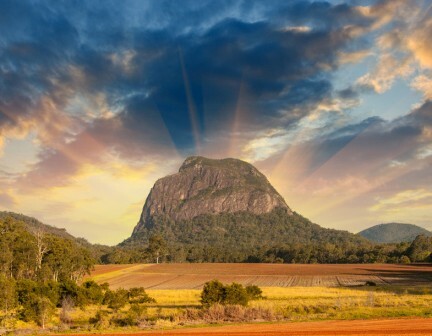 As part of the NSW Government’s commitment to cutting red tape and updating legislation to improve outcomes, a comprehensive review into the management of Crown land has been completed. The Review started in June 2012, with the aim of improving management of Crown land and increasing the benefits and returns from Crown land to the community. The Crown Lands Legislation White Paper contains proposals to develop one new piece of legislation that will replace eight existing Acts, streamline existing provisions, simplify the management of Crown reserves and reduce red tape. Comments are welcome on the White Paper and will be open until 20 June 2014 at 5pm. For more information about the White paper and how to make a submission, go to White Paper consultation. Notice of determination - Gemfish proposed listing as a vulnerable species. The Fisheries Scientific Committee (FSC) has made a proposed determination (PDF 58.7 KB) to list Gemfish (Rexea solandri) in the Threatened Species Schedules of the Fisheries Management Act 1994. In accordance with criteria prescribed by the Fisheries Management (General) Regulation 2010, the FSC reviewed information and found that the Gemfish is facing a high risk of extinction in NSW in the medium-term future, and the species is eligible to be listed as Vulnerable in Part 1 of Schedule 5 of the Act. Submissions must be received before 6:00 pm on Friday 13 June 2014. Please note that all submissions may be made public unless confidentiality is specifically requested. How would you cast your vote for the Reef? When dredging and dumping in World Heritage waters at Abbot Point was approved earlier this year, it was a massive blow. It was evidence that the Australian Government couldn’t be trusted to protect our national icon, on their own. Then three weeks ago, the tide turned. UNESCO - the UN body responsible for protecting World Heritage places - released an alarming assessment of the Reef. It highlighted dumping as an unacceptable threat to the Reef - putting the Reef at risk of being listed as ‘in danger’ - the World Heritage list of shame. Not only would this be a major embarrassment for Australia’s international reputation, but it would damage Australia’s tourism industry - worth 63,000 jobs and $6 billion per year - and the local communities that depend on it. In just three weeks, the World Heritage Committee will hold a crucial vote that could help stop the rapid industrial development of the Reef. For the first time, you get to vote too. How does the vote work? YouNesco is a new initiative to make sure that the UNESCO World Heritage Committee hears from the public - not just Governments - before they make big decisions. It’s a chance to have a say on decisions that are normally made behind closed doors. You vote through YouNesco - we package up the votes and deliver them directly to the World Heritage Committee at their meeting. This year the meeting is in Doha and Rick Leck from WWF will be there on behalf of Fight for the Reef, delivering the votes to the Committee on 16 June. We know that the international pressure of respected bodies like UNESCO and the World Heritage Committee is vital. This is our chance to help deliver the first step in Reef protection - a ban on dumping - before it’s too late. Let’s make it happen! It is the site of a remarkable rainfall record spanning more than 40 years, the only place where scientists study zebra finches – the bird equivalent of lab rats – in the wild, and the land where much of what we know about kangaroos was discovered. These unique scientific features of Fowlers Gap Arid Zone Research Station were showcased during a recent visit by senior staff to the remote UNSW property near Broken Hill in western NSW. A studio was also launched for artists inspired by the station’s dramatic landscape, with its rocky ranges, saltbush flats and creeks filled with red gums. Professor Les Field, Deputy Vice-Chancellor (Research) officially opened Silcrete Lodge, a towering creative space with a spectacular view, which UNSW students from fine arts, engineering and the built environment helped design and build. He thanked philanthropists Julian and Annie Beaumont, who were present at the ceremony, for their generous financial gift which made its construction possible. “This is a truly phenomenal building,” Professor Field said. Mr Beaumont said he hoped it would be a place where artists can free their minds of European constraints and reflect deeply on the ancient landscape and indigenous history of the site. “Art and science have been unified here for many thousands of years and we’re pleased to be contributing to this tradition,” he said. Fowlers Gap is the only research station in the arid zone of New South Wales, and UNSW holds a lease in perpetuity on the property, which is an important site for teaching as well as research. Professor Iain Martin, Deputy Vice-Chancellor (Academic); Professor Merlin Crossley, Dean of Science; and Professor Ross Harley, Dean of the College of Fine Arts were among the UNSW visitors who toured the station on Friday 9 May and listened to a range of scientific presentations. The second edition of Emeritus Professor Terry Dawson’s seminal book, Kangaroos, which explores the biology, ecology and social behaviour of these iconic animals, was launched. “Australians take kangaroos for granted. But they really are special animals,” said Professor Dawson, who has carried out research at Fowlers Gap for more than 50 years. The site is unique in having four types of kangaroos living there – Western Greys, Eastern Greys, Reds and Euros. His research shows that kangaroos are one of the most athletic mammals. Their fast hopping speeds rely on the facts that muscle makes up 50 per cent of their body mass, and their muscles have exceptionally high levels of mitochondria - the energy-generating parts of cells. Australian birds have very different mating behaviours and social systems than birds overseas, Associate Professor Simon Griffiths, of Macquarie University, told the gathering. He has studied zebra finches, apostlebirds and chestnut-crowned babblers at Fowlers Gap for more than 10 years, attracting more than $3million in Australian Research Council grants. These studies provide unique insights into cooperative behaviours, such as how some chestnut-crowned babblers forgo breeding to help raise the offspring of others in the group. Zebra finches are studied by many researchers overseas under laboratory conditions. “But Fowlers Gap is the only place in the world where people are working on wild zebra finches,” Associate Professor Griffiths said. Rainfall measurements have been collected at 17 sites on the Fowlers Gap property since the 1970s, and are now readily accessible to researchers. “This is an incredible achievement of international significance in the hydrology world,” said Professor Ian Acworth, of the UNSW Connected Waters Initiative Research Centre. A network of 12 bores have recently been installed on the property to study how rainfall recharges underground aquifers, as part of $15 million UNSW-led project to provide groundwater-related infrastructure across the continent. The manual rainfall gauges on the property have also been replaced with modern gauges that are monitored remotely using the Telstra 3G network. And video cameras and flow gauges have been installed on two creeks to monitor flood events. “On 28 March 2014, Fowlers Gap Creek reached a depth of more than 2 metres in less than 15 minutes,” Professor Acworth said. "By 6 April, the ducks had already moved in." The Federal Environment Minister, Greg Hunt, and the NSW Minister for Planning, Pru Goward, today released a New South Wales draft bilateral agreement on environmental approvals for public comment. Minister Hunt said the One-Stop Shop reforms are a key Coalition election commitment that will reduce duplication of environmental assessment and approval processes between the Australian Government, states and territories. "The Australian Government's One-Stop Shop reform has today taken a major step forward with the release of the approval bilateral agreement with New South Wales for public comment." "Business efficiency will be improved while maintaining the strong environmental standards under federal law. This will help to grow the economy, reduce costs for business, boost productivity and create jobs." Minister Goward said NSW and the Commonwealth are now one step closer to a more sensible system that removes the kinds of unnecessary duplication and overlap that add delays and costs without any further environmental protection. "This is an important step, and I look forward to finalising resourcing arrangements at the time the bilateral agreement is signed. "Having two sets of assessment and approval requirements adds costs that proponents just shouldn't have to bear." "That's why the Baird and Abbott governments are getting on with the job of making the planning system simpler and more efficient to deliver the job-creating infrastructure and investment our State needs sooner and at lower cost." The Australian and New South Wales Governments have signed a Memorandum of Understanding to establish the One-Stop Shop and have already entered into a new bilateral agreement to streamline environmental assessments. The approval bilateral agreement is the final stage in the process. The draft bilateral agreement further identifies additional streamlining measures, including strategic assessments, to further reduce duplication in environmental assessment and approval processes. The draft approval bilateral agreement with NSW is open for public comment until Friday 13th June. A revolutionary online tool to support young people living with depression or a mental health issue is being developed by University of Sydney software engineers. The team is adapting online tracking techniques used by marketing analysts in their internet-based tool dubbed, CyberMate. The researchers aim to design algorithms that will give CyberMate the ability to screen a young person's social networking pages such as Facebook or Twitter for comments that may indicate potential for self-harm. CyberMate would then act as a quasi-psychotherapist and engage with the young online user suggesting options for help or support via email or SMS. Associate Professor Rafael Calvo, director of the Software Engineering Group at the School of Electrical and Information Engineering, and leader of the three-year project, says data collected from social networking sites can play an important role in helping to identify and understand the needs of young adults. As the digital world plays an ever increasing role in young people's lives Professor Calvo says it's essential that researchers investigate how best to leverage its usage for evidence-based interventions. Statistics from a recent study of 2000 Australian youths aged between 12 to 25 years revealed more than two-thirds used the Internet to connect with their friends and other young people. "More importantly almost forty per cent reported searching for information about a mental health problems, regardless of whether they were the ones experiencing problems," says Professor Calvo. "Marketing organisations routinely track users as they navigate the web, and use personal and behavioural data to target advertising. This project aims to use this and other data to improve mental health interventions. "Our research requires the creation of new technologies that combine data mining and natural language processing. We are focussed on combining human-computer interaction techniques and psychotherapy." CyberMate will be evaluated by mental health practitioners and researchers based at the University's Brain and Mind Research Institute before being trialled by 210 young people over a year-long period. The project has been supported by the Inspire Foundation which has a number of Internet initiatives and continuously explores new ways of reaching its audience. ReachOut.com its flagship website is reported to have connected with 1,400,000 Australian youth in 2013 alone. Dr Ruth Fielding and Associate Professor Lesley Harbon of the Faculty of Education and Social Work have examined four bilingual primary schools in Campsie (Korean), Rouse Hill (Mandarin), Scots Head (Indonesian) and Murray Farm (Japanese), where year 1-5 students learned subjects such as geography, music and history through a second language. "As soon as you step into these classrooms you can see that the children love learning, and are engaging with concepts from a range of key learning areas through the new language," said Dr Fielding. "Parents and teachers demonstrated how they see their children enjoying and benefitting from language learning in ways they have not seen through other styles of language program that they have experienced before." Embedding language education within another learning area could be one way for schools to teach languages within a crowded curriculum, she said. Their next phase of research will focus on bilingual teachers' pedagogy, to glean more information about effective language teaching. Separate and ongoing research led by Associate Professor Ken Cruickshank is exploring language learning in K-12 across NSW government and non-government schools. Maximising Australia's Language Resources is the first study to research the gap between government policy and implementation with its focus on Sydney and Wollongong. The Australian Research Council (ARC) Linkage Project has to date identified the importance of incentives for HSC language study and the need for more flexibility in the provision of languages. "We know that teachers, parents and students have positive attitudes to language learning and support it, especially when they have had any experience of learning or growing up with languages. In many primary schools, parents fund languages programs themselves but there is a real need for governments to take it seriously," said Associate Professor Cruickshank. May 28, 2014 - Worldwide, there has been a startling increase in rates of obesity and overweight in both adults (28% increase) and children (up by 47%) in the past 33 years, with the number of overweight and obese people rising from 857 million in 1980 to 2.1 billion in 2013, according to a major new analysis from the Global Burden of Disease Study 2013, published in The Lancet. However, the rates vary widely throughout the world with more than half of the world's 671 million obese individuals living in just ten countries - the USA (more than 13%), China and India (15% combined), Russia, Brazil, Mexico, Egypt, Germany , Pakistan, and Indonesia. In high-income countries, some of the highest increases in adult obesity prevalence have been in the USA (where roughly a third of the adult population are obese),Australia (where 28% of men and 30% of women are obese), and the UK (where around a quarter of the adult population are obese). The findings come from a comprehensive new analysis of the global, regional, and national prevalence of overweight and obesity in adults aged 20 years and older and children and adolescents aged 2-19 years between 1980 and 2013. The authors warn that the study presents a worrying picture of substantial rises in obesity rates across the world and say that concerted action is urgently needed to reverse this trend. Led by Professor Emmanuela Gakidou from the Institute for Health Metrics and Evaluation at the University of Washington in the USA, a team of international researchers performed a comprehensive search of the available data from surveys, reports, and the scientific literature to track trends in the prevalence of overweight (body mass index of 25kg/m² or higher) and obesity (BMI of 30kg/m² or higher) in 188 countries in all 21 regions of the world from 1980 to 2013. In the developed world, men have higher rates of obesity than women, while the opposite is true in developing countries. Currently, 62% of the world's obese people live in developing countries. The greatest gain in overweight and obesity occurred globally between 1992 and 2002, mainly among people aged between 20 and 40. Especially high rates of overweight and obesity have already been reached in Tonga where levels of obesity in men and women exceed 50%, and in Kuwait, Libya, Qatar, and the Pacific Islands of Kiribati, Federated States of Micronesia, and Samoa where most (more than 50%) of women are obese. The prevalence of overweight and obesity in childhood has increased remarkably in developed countries, from 17% in 1980 to 24% in 2013 in boys and from 16% to 23% in girls. Similarly, in developing countries, rates have risen from roughly 8% to 13% in both boys and girls over the three decades. In 2013, the proportion of obesity in girls reached 23% in Kuwait, and 30% or more in Samoa, Micronesia and Kiribati, the highest levels calculated. Similar trends in obesity were found in boys, with the Pacific Islands of Samoa and Kiribati showing the greatest obesity prevalence. Within Western Europe, levels of obesity in boys ranged from 14% in Israel and 13% in Malta, to 4% in The Netherlands and Sweden. Levels of obesity in girls were highest in Luxembourg (13%) and Israel (11%), and lowest in the Netherlands Norway, and Sweden (4%). In developed countries, the rate of increase in adult obesity has started to slow down in the past 8 years, and there is some evidence that more recent birth cohorts are gaining weight more slowly than previous ones. According to Professor Gakidou, "Unlike other major global health risks, such as tobacco and childhood nutrition, obesity is not decreasing worldwide. Our findings show that increases in the prevalence of obesity have been substantial, widespread, and have arisen over a short time. However, there is some evidence of a plateau in adult obesity rates that provides some hope that the epidemic might have peaked in some developed countries and that populations in other countries might not reach the very high rates of more than 40% reported in some developing countries." "Our analysis suggests that the UN's target to stop the rise in obesity by 2025 is very ambitious and is unlikely to be achieved without concerted action and further research to assess the effect of population-wide interventions, and how to effectively translate that knowledge into national obesity control programmes. In particular, urgent global leadership is needed to help low-and middle-income countries intervene to reduce excessive calorie intake, physical inactivity, and active promotion of food consumption by industry." Commenting on the implications of the study, Professor Klim McPherson from Oxford University in the UK writes, "An appropriate rebalancing of the primal needs of humans with food availability is essential, which would entail curtailing many aspects of production and marketing for food industries. To prevent unsustainable health consequences, BMI needs to return to what it was 30 years ago. Lobstein calculated that to reduce BMI to 1980 levels in the UK would require an 8% reduction in consumption across the country, costing the food industry roughly £8•7 billion per year." He adds, "The solution has to be mainly political and the questions remain, as with climate change, where is the international will to act decisively in a way that might restrict economic growth in a competitive world, for the public's health? Nowhere yet, but voluntary salt reduction might be setting a more achievable trend. 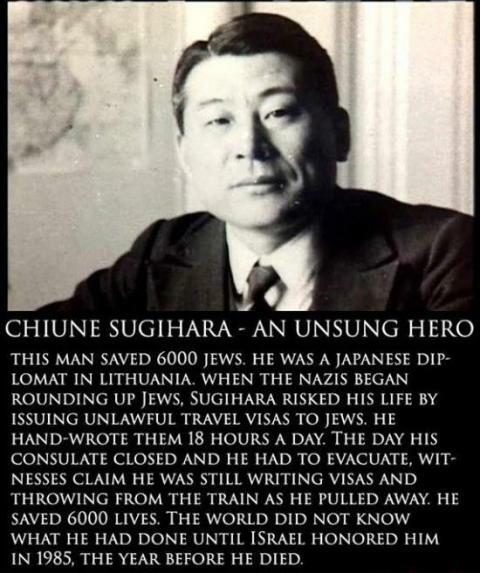 Politicians can no longer hide behind ignorance or confusion." May 29, 2014 – Using a genetically modified form of the HIV virus, a team of University of Nebraska-Lincoln scientists has developed a promising new approach that could someday lead to a more effective HIV vaccine. The team, led by chemist Jiantao Guo, virologist Qingsheng Li and synthetic biologist Wei Niu, has successfully tested the novel approach for vaccine development in vitro and has published findings in the international edition of the German journal Angewandte Chemie. With the new approach, the UNL team is able to use an attenuated - or weakened - HIV virus in the vaccine. The new method involves manipulating the virus' codons - a sequence of three nucleotides that form genetic code - to rely on an unnatural amino acid for proper protein translation, which allows it to replicate. Because this amino acid is foreign to the human body, the virus cannot continue to reproduce, Guo said. Adaptive immunity is developed when the body's immune system develops antibodies that attack the virus. The virus is then shut off from replicating by removing the amino acid. "Since the unnatural amino acid is not present in humans, the virus cannot further replicate and cause disease once a desirable protection is achieved," Guo said. On June 1, they will begin the next phase of development through a four-year, $1.9 million grant from the National Institutes of Healthand the National Institute of Allergy and Infectious Diseases. The grant will allow further research involving the genetically modified virus and lead to animal trials of the vaccine. Since the HIV/AIDS pandemic began in the 1980s, an estimated 36 million people have died from the disease. Today, more than 35 million people live with the virus and 2.5 million new infections are recorded each year. No universal cure or vaccine exists, mainly because of the virus' persistent replication and evolution. The most successful vaccination attempt in humans - a trial in Thailand in the middle of the last decade - had a roughly 31 percent efficacy rate. But that vaccine used engineered versions of HIV genes and proteins, rather than the actual virus. "The science tells us a live-attenuated vaccine would work best to stop the pandemic and possibly eradicate the disease," Li said. "But, using a live virus in a human trial has safety concerns." Using an attenuated virus in a vaccine has not been accomplished before because HIV - even a weakened form of the virus - replicates rapidly, which allows it to evolve quickly and regain is virulence and disease-causing ability. With the funds from the grant, Guo, assistant professor of chemistry, and Li, associate professor of biology, along with Niu, research assistant professor in chemistry, will perfect the technology and begin new trials. May 28, 2014 - The overall number and nature of mutations - rather than the presence of any single mutation - influences an individual's risk of developing schizophrenia, as well as its severity, according to a discovery by Columbia University Medical Center researchers published in the latest issue of Neuron. The findings could have important implications for the early detection and treatment of schizophrenia. Maria Karayiorgou, MD, professor of psychiatry and Joseph Gogos, MD, PhD, professor of physiology and cellular biophysics and of neuroscience, and their team sequenced the "exome" - the region of the human genome that codes for proteins - of 231 schizophrenia patients and their unaffected parents. Using this data, they demonstrated that schizophrenia arises from collective damage across several genes. "This study helps define a specific genetic mechanism that explains some of schizophrenia's heritability and clinical manifestation," said Dr. Karayiorgou, who is acting chief of the Division of Psychiatric and Medical Genetics at the New York State Psychiatric Institute. "Accumulation of damaged genes inherited from healthy parents leads to higher risk not only to develop schizophrenia but also to develop more severe forms of the disease." Schizophrenia is a severe psychiatric disorder in which patients experience hallucination, delusion, apathy and cognitive difficulties. The disorder is relatively common, affecting around 1 in every 100 people, and the risk of developing schizophrenia is strongly increased if a family member has the disease. Previous research has focused on the search for individual genes that might trigger schizophrenia. The availability of new high-throughput DNA sequencing technology has contributed to a more holistic approach to the disease. The researchers compared sequencing data to look for genetic differences and identify new loss-of-function mutations - which are rarer, but have a more severe effect on ordinary gene function - in cases of schizophrenia that had not been inherited from the patients' parents. They found an excess of such mutations in a variety of genes across different chromosomes. Using the same sequencing data, the researchers also looked at what types of mutations are commonly passed on to schizophrenia patients from their parents. It turns out that many of these are "loss-of-function" types. These mutations were also found to occur more frequently in genes with a low tolerance for genetic variation. "These mutations are important signposts toward identifying the genes involved in schizophrenia," said Dr. Karayiorgou. The researchers then looked more deeply into the sequencing data to try to determine the biological functions of the disrupted genes involved in schizophrenia. They were able to verify two key damaging mutations in a gene called SETD1A, suggesting that this gene contributes significantly to the disease. SETD1A is involved in a process called chromatin modification. Chromatin is the molecular apparatus that packages DNA into a smaller volume so it can fit into the cell and physically regulates how genes are expressed. Chromatin modification is therefore a crucial cellular activity. The finding fits with accumulating evidence that damage to chromatin regulatory genes is a common feature of various psychiatric and neurodevelopmental disorders. By combining the mutational data from this and related studies on schizophrenia, the authors found that "chromatin regulation" was the most common description for genes that had damaging mutations. "A clinical implication of this finding is the possibility of using the number and severity of mutations involved in chromatin regulation as a way to identify children at risk of developing schizophrenia and other neurodevelopmental disorders," said Dr. Gogos. "Exploring ways to reverse alterations in chromatic modification and restore gene expression may be an effective path toward treatment." In further sequencing studies, the researchers hope to identify and characterize more genes that might play a role in schizophrenia and to elucidate common biological functions of the genes. May 28, 2014 – A new study involving Simon Fraser University researchers has found that prenatal exposure to flame retardants can be significantly linked to lower IQs and greater hyperactivity in five-year old children. The findings are published online today in the journal Environmental Health Perspectives. May 28, 2014 - Biomedical engineering researchers have developed daisy-shaped, nanoscale structures that are made predominantly of anti-cancer drugs and are capable of introducing a "cocktail" of multiple drugs into cancer cells. The researchers are all part the joint biomedical engineering program at North Carolina State University and the University of North Carolina at Chapel Hill. "We found that this technique was much better than conventional drug-delivery techniques at inhibiting the growth of lung cancer tumors in mice," says Dr. Zhen Gu, senior author of the paper and an assistant professor in the joint biomedical engineering program. "And based on in vitro tests in nine different cell lines, the technique is also promising for use against leukemia, breast, prostate, liver, ovarian and brain cancers." To make the "nanodaisies," the researchers begin with a solution that contains a polymer called polyethylene glycol (PEG). The PEG forms long strands that have much shorter strands branching off to either side. Researchers directly link the anti-cancer drug camptothecin (CPT) onto the shorter strands and introduce the anti-cancer drug doxorubicin (Dox) into the solution. PEG is hydrophilic, meaning it likes water. CPT and Dox are hydrophobic, meaning they don't like water. As a result, the CPT and Dox cluster together in the solution, wrapping the PEG around themselves. This results in a daisy-shaped drug cocktail, only 50 nanometers in diameter, which can be injected into a cancer patient. Once injected, the nanodaisies float through the bloodstream until they are absorbed by cancer cells. In fact, one of the reasons the researchers chose to use PEG is because it has chemical properties that prolong the life of the drugs in the bloodstream. Once in a cancer cell, the drugs are released. "Both drugs attack the cell's nucleus, but via different mechanisms," says Dr. Wanyi Tai, lead author and a former postdoctoral researcher in Gu's lab. "Combined, the drugs are more effective than either drug is by itself," Gu says. "We are very optimistic about this technique and are hoping to begin pre-clinical testing in the near future." May 28, 2014 – A Harvard-led team is the first to demonstrate the ability to use low-power light to trigger stem cells inside the body to regenerate tissue, an advance they reported in Science Translational Medicine. The research, led by Wyss Institute Core Faculty member David Mooney, Ph.D., lays the foundation for a host of clinical applications in restorative dentistry and regenerative medicine more broadly, such as wound healing, bone regeneration, and more. The team used a low-power laser to trigger human dental stem cells to form dentin, the hard tissue that is similar to bone and makes up the bulk of teeth. What's more, they outlined the precise molecular mechanism involved, and demonstrated its prowess using multiple laboratory and animal models. A number of biologically active molecules, such as regulatory proteins called growth factors, can trigger stem cells to differentiate into different cell types. Current regeneration efforts require scientists to isolate stem cells from the body, manipulate them in a laboratory, and return them to the body - efforts that face a host of regulatory and technical hurdles to their clinical translation. But Mooney's approach is different and, he hopes, easier to get into the hands of practicing clinicians. "Our treatment modality does not introduce anything new to the body, and lasers are routinely used in medicine and dentistry, so the barriers to clinical translation are low," said Mooney, who is also the Robert P. Pinkas Family Professor of Bioengineering at Harvard's School of Engineering and Applied Sciences (SEAS). "It would be a substantial advance in the field if we can regenerate teeth rather than replace them." Arany took rodents to the laboratory version of a dentist's office to drill holes in their molars, treat the tooth pulp that contains adult dental stem cells with low-dose laser treatments, applied temporary caps, and kept the animals comfortable and healthy. After about 12 weeks, high-resolution x-ray imaging and microscopy confirmed that the laser treatments triggered the enhanced dentin formation. "It was definitely my first time doing rodent dentistry," said Arany, who faced several technical challenges in performing oral surgery on such a small scale. The dentin was strikingly similar in composition to normal dentin, but did have slightly different morphological organization. Moreover, the typical reparative dentin bridge seen in human teeth was not as readily apparent in the minute rodent teeth, owing to the technical challenges with the procedure. "This is one of those rare cases where it would be easier to do this work on a human," Mooney said. Next the team performed a series of culture-based experiments to unveil the precise molecular mechanism responsible for the regenerative effects of the laser treatment. It turns out that a ubiquitous regulatory cell protein called transforming growth factor beta-1 (TGF-β1) played a pivotal role in triggering the dental stem cells to grow into dentin. TGF-β1 exists in latent form until activated by any number of molecules. Here is the chemical domino effect the team confirmed: In a dose-dependent manner, the laser first induced reactive oxygen species (ROS), which are chemically active molecules containing oxygen that play an important role in cellular function. The ROS activated the latent TGF-β1complex which, in turn, differentiated the stem cells into dentin. Since the dawn of medical laser use in the late 1960s, doctors have been accumulating anecdotal evidence that low-level light therapy can stimulate all kind of biological processes including rejuvenating skin and stimulating hair growth, among others. But interestingly enough, the same laser can be also be used to ablate skin and remove hair - depending on the way the clinician uses the laser. The clinical effects of low-power lasers have been subtle and largely inconsistent. The new work marks the first time that scientists have gotten to the nub of how low-level laser treatments work on a molecular level, and lays the foundation for controlled treatment protocols. "The scientific community is actively exploring a host of approaches to using stem cells for tissue regeneration efforts," said Wyss Institute Founding Director Don Ingber, M.D., Ph.D., "and Dave and his team have added an innovative, noninvasive and remarkably simple but powerful tool to the toolbox." Next Arany aims to take this work to human clinical trials. He is currently working with his colleagues at the National Institute of Dental and Craniofacial Research (NIDCR), which is one of the National Institutes of Health (NIH), to outline the requisite safety and efficacy parameters. "We are also excited about expanding these observations to other regenerative applications with other types of stem cells," he said. May 28, 2014 – A mechanism that enables the development of resistance to Acute Myeloid Leukemia (AML) anticancer drugs, thereby leading to relapse, has been identified by Kathy Borden of the University of Montreal's Institute for Research in Immunology and Cancer (IRIC) and her collaborators. Kathy Borden is a Principal Investigator at IRIC and a professor at the university's Department of Pathology and Cell Biology. The development of drug resistance is one of the main problems in clinical oncology and the cause of relapse in many patients. The new discovery, recently published in the scientific journal Nature, constitutes a major breakthrough in the fight against AML, one of the deadliest forms of leukemia, because it immediately suggests strategies to overcome drug resistance. Furthermore, the type of drug resistance the team identified is likely implicated in other cancers and a successful new treatment regimen based on these findings could have broad applications in treating cancer. Previous work by Professor Borden's team had indicated that the use of ribavirin, a compound that was originally developed as an antiviral drug, could result in real benefits for certain cancer patients. With support from The Leukemia & Lymphoma Society of the USA, a first clinical trial using ribavirin to treat poor-prognosis AML patients was performed under the supervision of Dr. Sarit Assouline and Dr. Wilson Miller of the Segal Cancer Center at the Jewish General Hospital in Montréal. "This first clinical study yielded extremely promising results in most patients, including remissions, with no significant treatment-related toxicity. However, as is often the case when using a single drug, all patients eventually relapsed," recall Drs. Assouline and Miller. The multi-center study also included patients from the Hôpital Maisonneuve-Rosemont (HMR) in Montreal and the McMaster University/Hamilton Health Sciences Center in Hamilton, Ontario. In their recent article, the researchers describe why, in most of the patients, ribavirin as well as the standard chemotherapeutic drug cytarabine (Ara-C), eventually become ineffective at killing cancer cells. "By studying drug resistant cancer cells from AML patients and head and neck tumors, we found that a gene called "GLI1" is dramatically overactive in these cells," explains Hiba Zahreddine, doctoral student in the laboratory of Kathy Borden and first author of the Nature article. "With the help of our colleagues at Pharmascience Inc. we were then able to show that this results in a specific chemical change to the drugs, that prevents their toxicity toward the cancer cells," continues Professor Borden. Fortunately, drugs that inhibit the activity of GLI1 are currently available and the scientists showed that these drugs could switch the cancer cells back into a ribavirin-sensitive state. It is hoped that when used in combination-therapy with ribavirin (or more standard chemotherapy), these drugs will prevent the development of drug resistance in patients. The team has now received approval from Health Canada to undertake a new clinical trial to test the novel drug combination in AML patients. As part of its research partnership with Université de Montréal, Pharmascience Inc. will continue to manufacture and provide the ribavirin necessary for this clinical trial. "If this new approach is successful, it could have very broad applications since the mode of action of ribavirin suggests that it could be effective against up to 30% of all cancers including some types of breast, prostate, colon, stomach and head and neck cancers in addition to AML," explains Morris Goodman, co-founder and Chairman of the Board of Pharmascience Inc.
A centre aimed at ensuring the continued safety of fresh food produced in Australia and New Zealand, hosted by the University of Sydney, opens today. "The University of Sydney is delighted to host the new industry funded Fresh Produce Safety Centre.We see the Centre as the embodiment of the University's desire to reach out to industry, identify research gaps and address research priorities in fresh produce safety," said Professor Mark Adams, Dean of the Faculty of Agriculture and Environment at the University. The centre will work with every sector of the fresh produce supply chain including growers and processors through to researchers and peak industry bodies. The newly appointed board of directors said the centre has been established to address an important gap in the industry; the need to promote research, outreach and education on fresh produce safety throughout Australia and New Zealand. "Australia's fruit and vegetable industry is worth over $7 billion and international markets seek out Australian products because of its record of food safety. We want to ensure our supply chains continue to operate on the best available information," said Associate Professor Robyn McConchie, from the University's Faculty of Agriculture and Environment. Professor McConchie and Michael Worthington, CEO of Produce Marketing Association A-NZ, working with Horticulture Australia, have brought together industry stakeholders to support the Fresh Produce Safety Centre. "While government, industry and quality assurance agencies are implementing protocols based on the best available information, there is a lack of general awareness of the risk of microbial contamination of fresh produce and more importantly, there is a lack of Australian based research to inform the Australian industry of best practice, " Associate Professor McConchie said. "This centre will not only enhance our produce safety practices but will also deal with outbreaks in the region, particularly crisis mitigation, management and consumer communication." Associate Professor McConchie is currently investigating the survival of Salmonella in soils treated with chicken manure and the potential use of crops such as buckwheat and mustard that contain antimicrobial compounds, to kill Salmonella. "Salmonella is the second highest cause of food-borne disease in Australia, and improper use of manures during vegetable production is potentially a significant source of preharvest contamination so this research has great potential for addressing the problem." This research for the Fresh Produce Safety Centre is being done in partnership with researchers at the University of California, Davis. The Fresh Produce Safety Centre is being hosted by the University under a project with the PMA A-NZ, the Australasian region's leading fresh produce trade association. The FPSC has been funded by Horticulture Australia Limited using voluntary contributions from industry and matched funds from the Australian Government. The Long Gallery at the Australian Museum is being transformed to showcase rare and fascinating items from our vast collection including prized skeletons, extinct mammals, rare insects, ancient minerals and items from the internationally-renowned Indigenous and Pacific collections. We need your support to create a home for Australia's most intriguing collections and to continue the legacy of Australia's oldest gallery. May 27, 2014 – In a PLOS Medicine guest editorial, Paul Glasziou, Professor of Evidence-Based Medicine at Bond University in Australia, explores how open access publications could help moderate and reduce the vast waste of global medical research. Continuing on from his previous work, which highlighted how most of the world's expenditure on medical research was thrown away, Glasziou outlines how bad the situation is and suggests how it might be improved. Subscription-based academic journals make money by through copyrights assigned by authors to publishers who lock the articles behind paywalls. Open access models, in which journals charge a publication fee and then make research and related content fully and immediately available to all, stand to aid the dissemination of knowledge and to improve its quality. "The waste sounds bad but the reality is worse," writes Glasziou. "The estimate that '85% of research' is wasted referred only to activities prior to the point of publication." After that, he points out, other barriers create post-publication waste. Despite all the effort and attention put into funding medical research through charitable and government programmes, publishing models that restrict access to research outcomes mean that profit comes at the expense of human health. The systems that encourage poor research and poor communication of research findings may seem like dry subjects but the waste they cause costs lives. Charities and governments should ensure the work they fund and authorise is published in an open access manner, thereby making it far more effective. "To get full value from research investment," Glasziou concludes, "we need to reduce both the annual $100 billion of pre-publication (research production) waste and the unquantified cost of post-publication (research dissemination) barriers … If over a hundred billion dollars of medical research money were being wasted by corruption, the public and political outcry would be overwhelming. That resources of this magnitude are being wasted through incompetence and inattention should be seen as a similar scandal. Badly designed and poorly thought through systems of research and dissemination subtract massively from global human health." Smoke from traditional cookstoves kills around 4 million people each year. In this video we meet several families in India - and hear why they're reluctant to use 'improved' cookstoves that produce less smoke. 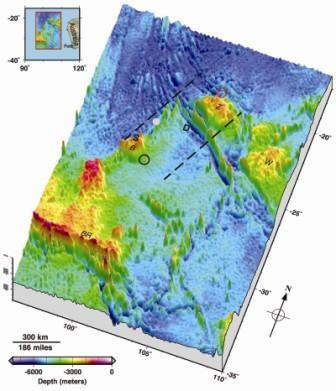 May 27, 2014 – A new illustration of the seafloor, created by two of the world's leading ocean floor mapping experts that details underwater terrain where the missing Malaysia Airlines flight might be located, could shed additional light on what type of underwater vehicles might be used to find the missing airplane and where any debris from the crash might lie. The seafloor topography map illustrates jagged plateaus, ridges and other underwater features of a large area underneath the Indian Ocean where search efforts have focused since contact with Malaysia Airlines flight MH370 was lost on March 8. The image was published today in Eos, the weekly newspaper of the Earth and space sciences, published by the American Geophysical Union. The new illustration of a 2,000 kilometer by 1,400 kilometer (1,243 miles by 870 miles) area where the plane might be shows locations on the seafloor corresponding to where acoustic signals from the airplane's black boxes were reportedly detected at the surface by two vessels in the area. It also shows the two plateaus near where these "pings" were heard. It points out the deepest point in the area: 7,883 meters (about five miles) underneath the sea in the Wallaby-Zenith Fracture Zone - about as deep as 20 Empire State buildings stacked top to bottom. Undersea mountains and plateaus rise nearly 5,000 meters (about three miles) above the deep seafloor, according to the map. The illustration, designated as Figure 1 of the Eos article, was created by Walter H.F. Smith and Karen M. Marks, both of the National Oceanic and Atmospheric Administration's Laboratory for Satellite Altimetry in College Park, Maryland, and the former and current chairs, respectively, of the Technical Sub-Committee on Ocean Mapping of the General Bathymetric Chart of the Oceans, or GEBCO. GEBCO is an international organization that aims to provide the most authoritative publicly available maps of the depths and shapes of the terrain underneath the world's oceans. Satellite altimetry has made it possible to depict the topography of vast regions of the seafloor that would otherwise have remained unmapped, Smith said. To illustrate the topography of the search area, Smith and Marks used publicly available data from GEBCO and other bathymetric models and data banks, along with information culled from news reports. Smith said the terrain and depths shown in the map could help searchers choose the appropriate underwater robotic vehicles they might use to look for the missing plane. Knowing the roughness and shape of the ocean floor could also help inform models predicting where floating debris from the airplane might turn up. Smith cautions that the new illustration is not a roadmap to find the missing airplane. Nor does the map define the official search area for the aircraft, he added. "It is not 'x marks the spot'," Smith said of their map. "We are painting with a very, very broad brush." Search efforts for the missing airplane have focused on an area of the southern Indian Ocean west of Australia where officials suspect that the plane crashed after it veered off course. After an initial air and underwater search failed to find any trace of the airplane, authorities announced this month that they will expand the search area and also map the seabed in the area. Smith pointed out that the search for the missing plane is made more difficult because so little is understood about the seafloor in this part of the Indian Ocean. In the southeast Indian Ocean, only 5 percent of the ocean bottom has been measured by ships with echo soundings. Knowledge of the rest of the area comes from satellite altimetry, which provides relatively low-resolution mapping compared to ship-borne methods. "It is a very complex part of the world that is very poorly known," Smith said. A lack of good data about Earth's seafloors not only hinders search efforts, it also makes it harder for scientists to accurately model the world's environment and climate, Smith noted. Today, our knowledge of our planet's undersea topography is "vastly poorer than our knowledge of the topographies of Earth's Moon, Mars and Venus," Smith and Marks write in Eos. This is because these other planetary bodies have no oceans, making their surfaces relatively easy to sense from space. Smith said he hoped that "the data collected during the search for MH370 will be contributed to public data banks and will be a start of greater efforts to map Earth's ocean floor." Did standing up change our brains? Although lots of animals are smart, humans are even smarter. How and why do we think and act so differently from other species? A young boy's efforts while learning to walk have suggested a new explanation, in a new journal paper jointly authored by his father and grandfather, both academics at the University of Sydney. In the latest issue of the scientific journal, Frontiers in Neuroscience, the son-and-father team Mac and Rick Shine suggest that the big difference between humans and other species may lie in how we use our brains for routine tasks. They advance the idea that the key to exploiting the awesome processing power of our brain's most distinctive feature - the cortex - may have been to liberate it from the drudgery of controlling routine activities. And that's where young Tyler Shine, now two years old, comes into the story. When Tyler was first learning to walk, his doting father and grandfather noticed that every step took Tyler's full attention. But before too long, walking became routine, and Tyler was able to start noticing other things around him. He was better at maintaining his balance, which freed up his attention to focus on more interesting tasks, like trying to get into mischief. How did Tyler improve? His father and grandfather suggest that he did so by transferring the control of his balance to 'lower' parts of the brain, freeing up the powerful cortex to focus on unpredictable challenges, such as a bumpy floor covered in stray toys. "Any complicated task - like driving a car or playing a musical instrument - starts out consuming all our attention, but eventually becomes routine," Mac Shine says. "Studies of brain function suggest that we shift the control of these routine tasks down to 'lower' areas of the brain, such as the basal ganglia and the cerebellum. "So, humans are smart because we have automated the routine tasks; and thus, can devote our most potent mental faculties to deal with new, unpredictable challenges. "What event in the early history of humans made us change the way we use our brains? Watching Tyler learn to walk suggested that it was the evolutionary shift from walking on all fours, to walking on two legs. "Suddenly our brains were overwhelmed with the complicated challenge of keeping our balance - and the best kind of brain to have, was one that didn't waste its most powerful functions on controlling routine tasks." So, the Shines believe, those first pre-humans who began to stand upright faced a new evolutionary pressure not just on their bodies, but on their brains as well. "New technologies are allowing us to look inside the brain while it works, and we are learning an enormous amount," Mac Shine says. "But in order to interpret those results, we need new ideas as well. I'm delighted that my son has played a role in suggesting one of those ideas. "Hopefully, by the time he is watching his own son learn to walk, we will be much closer to truly understanding the greatest mystery of human existence: how our brains work." For many years Sergeant Kevin Briggs had a dark, unusual, at times strangely rewarding job: He patrolled the southern end of San Francisco's Golden Gate Bridge, a popular site for suicide attempts. In a sobering, deeply personal talk Briggs shares stories from those he's spoken — and listened — to standing on the edge of life. He gives a powerful piece of advice to those with loved ones who might be contemplating suicide. May 29, 2014 - What mode of transportation makes you happiest? Clemson researchers investigated how emotions like happiness, pain, stress, sadness and fatigue vary during travel and by travel mode in a new study published in the journalTransportation. Utilizing data from the American Time Use Survey, collected by the Bureau of Labor Statistics, the researchers were able to determine the average mood felt by people during different types of travel. "We found that people are in the best mood while they are bicycling compared to any other mode of transportation," said Eric Morris, lead author on the study and assistant professor in Clemson's planning, development and preservation department. Morris said that bicyclists tend to be a self-selected group who are very enthusiastic about their mode of transportation. "Bicyclists are generally younger and physically healthy, which are traits that happier people usually possess," he said. Next happiest are car passengers and then car drivers. Bus and train riders experience the most negative emotions, though a small part of this can be attributed to the fact that mass transit is disproportionately used for commuting to and from work, according to the researchers. Their findings suggest that bicycle use may have benefits beyond the typically cited health and transportation ones, and that improving transit riders' emotional experience may be as important as improving traditional service features, such as headways and travel speeds. "Understanding the relationship between how we travel and how we feel offers insight into ways of improving existing transportation services, prioritizing investments and theorizing and modeling the costs and benefits of travel," said Morris. May 29, 2014 - A new twist on 3-D imaging technology could one day enable your self-driving car to spot a child in the street half a block away, let you answer your Smartphone from across the room with a wave of your hand, or play "virtual tennis" on your driveway. The new system, developed by researchers at the University of California, Berkeley, can remotely sense objects across distances as long as 30 feet, 10 times farther than what could be done with comparable current low-power laser systems. With further development, the technology could be used to make smaller, cheaper 3-D imaging systems that offer exceptional range for potential use in self-driving cars, smartphones and interactive video games like Microsoft's Kinect, all without the need for big, bulky boxes of electronics or optics. "While meter-level operating distance is adequate for many traditional metrology instruments, the sweet spot for emerging consumer and robotics applications is around 10 meters" or just over 30 feet, says UC Berkeley's Behnam Behroozpour, who will present the team's work at CLEO: 2014, being held June 8-13 in San Jose, California, USA. "This range covers the size of typical living spaces while avoiding excessive power dissipation and possible eye safety concerns." The new system relies on LIDAR ("light radar"), a 3-D imaging technology that uses light to provide feedback about the world around it. LIDAR systems of this type emit laser light that hits an object, and then can tell how far away that object is by measuring changes in the light frequency that is reflected back. It can be used to help self-driving cars avoid obstacles halfway down the street, or to help video games tell when you are jumping, pumping your fists or swinging a "racket" at an imaginary tennis ball across an imaginary court. In contrast, current lasers used in high-resolution LIDAR imaging can be large, power-hungry and expensive. Gaming systems require big, bulky boxes of equipment, and you have to stand within a few feet of the system for them to work properly, Behroozpour says. Bulkiness is also a problem for driverless cars such as Google's, which must carry a large 3-D camera on its roof. The researchers sought to shrink the size and power consumption of the LIDAR systems without compromising their performance in terms of distance. In their new system, the team used a type of LIDAR called frequency-modulated continuous-wave (FMCW) LIDAR, which they felt would ensure their imager had good resolution with lower power consumption, Behroozpour says. This type of system emits "frequency-chirped" laser light (that is, whose frequency is either increasing or decreasing) on an object and then measures changes in the light frequency that is reflected back. To avoid the drawbacks of size, power and cost, the Berkeley team exploited a class of lasers called MEMS tunable VCSELs. MEMS (micro-electrical-mechanical system) parts are tiny micro-scale machines that, in this case, can help to change the frequency of the laser light for the chirping, while VCSELs (vertical-cavity surface-emitting lasers) are a type of inexpensive integrable semiconductor lasers with low power consumption. By using the MEMS device at its resonance - the natural frequency at which the material vibrates - the researchers were able to amplify the system's signal without a great expense of power. "Generally, increasing the signal amplitude results in increased power dissipation," Behroozpour says. "Our solution avoids this tradeoff, thereby retaining the low power advantage of VCSELs for this application." The team's next plans include integrating the VCSEL, photonics and electronics into a chip-scale package. Consolidating these parts should open up possibilities for "a host of new applications that have not even been invented yet," Behroozpour says - including the ability to use your hand, Kinect-like, to silence your ringtone from 30 feet away. 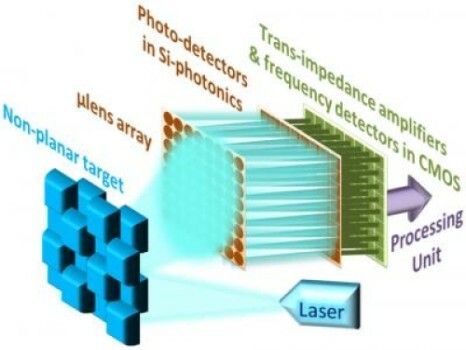 Presentation AW3H.2, titled "Method for Increasing the Operating Distance of MEMS LIDAR beyond Brownian Noise Limitation," will take place June 11. May 30, 2014 - A Curtin University researcher has shown that ancient volcanic eruptions in Australia 510 million years ago significantly affected the climate, causing the first known mass extinction in the history of complex life. Published in the journal Geology, Associate Professor Fred Jourdan from Curtin's Department of Applied Geology, along with colleagues from several Australian and international institutions, used radioactive dating techniques to precisely measure the age of the eruptions of the Kalkarindji volcanic province - where lavas covered an area of more than 2 million square kilometres in the Northern Territory and Western Australia. Dr Jourdan and his team were able to prove the volcanic province occurred at the same time as the Early-Middle Cambrian extinction from 510-511 million years ago -- the first extinction to wipe out complex multicellular life. "It has been well-documented that this extinction, which eradicated 50 per cent of species, was related to climatic changes and depletion of oxygen in the oceans, but the exact mechanism causing these changes was not known, until now," Dr Jourdan said. "Not only were we able to demonstrate that the Kalkarindji volcanic province was emplaced at the exact same time as the Cambrian extinction, but were also able to measure a depletion of sulphur dioxide from the province's volcanic rocks - which indicates sulphur was released into the atmosphere during the eruptions. "As a modern comparison, when the small volcano Pinatubo erupted in 1991, the resulting discharge of sulphur dioxide decreased the average global temperatures by a few tenths of a degree for a few years following the eruption. "If relatively small eruptions like Pinatubo can affect the climate just imagine what a volcanic province with an area equivalent to the size of the state of Western Australia can do." The team then compared the Kalkarindji volcanic province with other volcanic provinces and showed the most likely process for all the mass extinctions was a rapid oscillation of the climate triggered by volcanic eruptions emitting sulphur dioxide, along with greenhouse gases methane and carbon dioxide. "We calculated a near perfect chronological correlation between large volcanic province eruptions, climate shifts and mass extinctions over the history of life during the last 550 million years, with only one chance over 20 billion that this correlation is just a coincidence," Dr Jourdan said. Dr Jourdan said the rapid oscillations of the climate produced by volcanic eruptions made it difficult for various species to adapt, ultimately resulting in their demise. He also stressed the importance of this research to better understand our current environment. "To comprehend the long-term climatic and biological effects of the massive injections of gas in the atmosphere by modern society, we need to recognise how climate, oceans and ecosytems were affected in the past," he said.